Fifty years after he perpetrated some of the most heinous crimes in contemporary history, Adolf Hitler has been simplified into an icon of ultimate evil. Any exploration of Hitler's complexities as a man has become taboo. But what secrets did that mind hold that might be revelatory to us all? What made it so capable of causing and justifying so much torment? Could an exploration of Hitler's mind reflect back to us insights about ourselves and - in an age of ethnic cleansing, neo-nationalism and hate crimes - the psychology of our times? 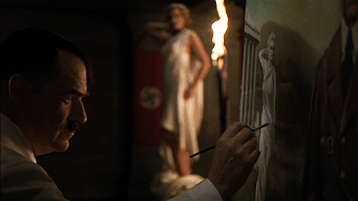 As a bold reimagining of Hitler, Barry J. Hershey's debut feature film The Empty Mirror defies the Hitler taboo and explores what might have happened inside Adolf Hitler's mind if, after World War II, he had been cut off from his role as Führer and left to contemplate his deeds, the myths he created, and the man he really was.